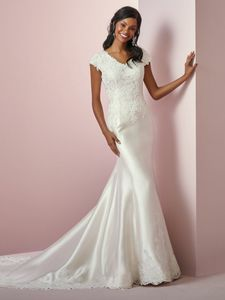 Description: Classic lace motifs accent the bodice and hemline in this Elodie Mikado wedding dress, completing the modest cap-sleeves and V-neckline. Lined with shapewear for a figure-flattering fit. Finished with covered buttons, trailing to the hemline, over zipper closure.